I am currently hunkered down under the twin weight of tonsilitis and a nasty cold - that's what you get for spending a couple of days in London - but back in the halcyon days when eating didn't feel like swallowing knives, I was a judge at Jane Asher's Home Baker of the Year competition. 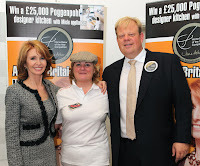 I'd previously interviewed Asher (pictured left in hat) about the competition at her Chelsea cake shop. It's surprisingly small and un-fancy, although presumably the va-va-voom factor increases when Nigella Lawson, apparently a regular customer, drops by for some wafer roses. To enter the competition, amateur bakers submit their cake recipes and the top five are selected to take part in a live bake-off, held this year at Poggenpohl's super-smooth Deansgate showroom. The top prize is £25,000 worth of Poggy kitchen, and it's a nice thought that at least one of them will be going to someone who cooks in the oven rather than using it to store their cashmere jumpers. So it was no surprise to find that competition was fierce, although it was a shame that one of the disappointed runners-up circulated afterwards, bitterly suggesting that there had been a coup. In fact, there was nothing of the sort. The judges - including Jane, Andrew Nutter, telly lady Lucy Meacock, Karen Barnes of Good Housekeeping, Lucy of Lucy Cooks and me - gathered around the cakes, ate them, and decided which one we liked best. A fruity Bakewell tart and a really good carrot cake were both lovely but flawed in some way, so after much deliberation we chose Helen Roscoe's Lancashire Belles, choux puffs filled with home-made parkin ice cream and drizzled with chocolate. The choux, ice cream and other frills were all very nice, but it was the parkin - gingery and oaty and fabulous - that clinched it. Two more things that are fabulous: Andrew Nutter's chef's jacket, which is appliqued with blue diamante, and Boots' packs of 30 nasal strips. Drugs are limited when you're pregnant, so thank God for the glamour of the anti-cold sticking plaster. Emma Sturgess is a food writer based in Hale, near Manchester. Fine restaurants, industry gossip and baking are key to her happiness. In 2009 she won the Guild of Food Writers award for Restaurant Reviewer of the Year. You can contact her here. Tim Bowden is a journalist based at the same address. He is also one half of the band Stately Homes Of England. You can contact him here.